￼ ￼ ￼ ￼ ￼ SEE THE BRAND NEW RELEASES AT BOTTOM OF PAGE ORDERS CONTACT HERE FINALLY... THEY ARE HERE!!! WAY BEYOND JUST A 432 HZ CD — INCLUDES 8HZ, CIRCADIAN TEMPOS, & SACRED GEOMETRICAL GOLDEN NUMBER RATIO’S THROUGHOUT THE COMPOSITIONS & MASTERING. A WINNING PIONEERING COMBINATION SCIENTIFICALLY MEASURED TO HAVE ITS EFFECT ON HEALTH, WELLBEING, HEART COHERENCE & INSPIRATIONAL BRAIN STATES WITH HIGHER BIOLOGICAL ENERGY. ONLY ECOLOGICAL QUALITY FORMATS, NOT JUNK MUSIC MP3 COMPRESSION. ANANDA BOSMAN’S MOTTO: “432 HZ: MAKING MUSIC GREAT AGAIN.” The LONG AWAITED professional production CD’s of Ananda’s revolutionary A=432 Hz music are NOW available for the world at large. Some of these songs have been measured to have dramatic health & wellbeing effects, scientifically measured. Our scientists measured that MP3 & other compression decreases the harmonic health & wellbeing effect by as much as 70%. So we supply ONLY 44,100Khz/16bit Quality Music ORDER YOURS NOW!!! Along with a host of completely new songs, the eagerly awaited new songs since 2008 have received additional enhancement & tuning. Many numerous music styles converge and emerge, which delight & appeal to a variety of musical tastes. ￼ Ambient Styles With great enthusiasm of this NU birth, here we present Ananda’s very first FULLY professionally produced music CD’s — every level of production, from composing, mastering, equalising, volume db mastering & fades, production, together with the graphic design of the album covers, insert booklets, and CD disk image, are entirely ALL produced by Ananda Bosman and 432hertz.com partner, Simone Waser. AUMbience Of The Heart is our all time most popular CD. The music is used by therapist to increase the coherence of the therapuetic environment, for recreation, to dance to with, as ambient background mus, and even for meditation. This CD charges one in the tasks one is working with. Truly independent music for the first glimmerings of a NU Sovereign World on the looming horizon Attractor Field of NU future history. ORDER YOURS NOW!!! ￼ Limited supplies of this first edition are available NOW. With discounts on bulk orders. Also check for special package offers. This CD combines Melodic Trance and Psytrance styles, all with the harmonic 144BPM, which is 2 times the 72BPM circadian pulse, that tunes all organs. It is great dance music, empowering and giving energy. Great for driving, and recharging when your battery is drained. A wide variety of unique dance styles by Ananda Bosman. Can even be used in meditation, with power breathing, by taking every second heart beat, at 72BPM. Hence, the 144BPM healthy rhythm of the heart when jogging or exercising and dancing, and the coherent heart rhythm when in compassionate love and meditation are co-joined. REMEMBER, ONLY THE CD QUALITY PRODUCES THE STRONG MEASURED HEALTH, WELL-BEING, CIRCADIAN, CARDIO-RHYTHM & CREATIVITY EFFECTS (from the 432Hz, 8Hz, harmonic tempos and UFOM)!!! CONTACT US FOR COMBO DEALS MEASUREMENTS SHOW THAT COMPRESSION TO MP3 VASTLY DIMINISHES THE EFFECTS. THE COMPRESSION USED IN MP3 & CO WILL NOT RELAY THE EFFECT THAT ONLY CD QUALITY PRODUCES, OVER 90% OF THE INFORMATION IS MISSING WITH MP3. OF COURSE THE SONGS MELODY WILL REMAIN FOR POPULARITY ;-) JUST SO THAT YOU KNOW. IMPORT YOUR SONGS IN AIF OR WAV FORMAT IN iTunes & Other Music Players. ORDER YOURS NOW!!! 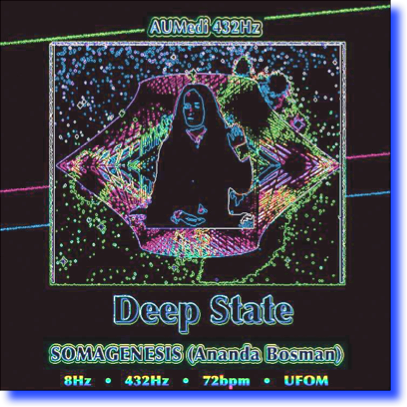 ￼ NOVEMBER 2014 Ananda Bosman’s NEW album DEEP STATE is NOW here. 4 years in the works, & FINALLY MASTERED, this quintessential work of deep music for traversing the meditation planes from Ananda is now available. A completely different kind of music style, to Ananda’s Previous creations. AUMbience of the Heart & AUMega Music Revolution are good for background energy, driving & charging. Deep State is About Inner Voyage, and its Many Cascaded Landscapes Architectured in the 8Hz, 432Hz, and UFOM sacred ratios This one is for deep states of consciousness & Meditation. A double CD that takes you on a highly specific harmonic journey. With deep touching melodies that sweep the soul encompassed in new sounds & effects on a myriad of scales. Attuned & organized by Sacred Geometrical principles, & even more interrelations of 8Hz, 432Hz, & UFOM than ever before. THIS IS COMPLETELY DIFFERENT MUSIC STYLE TO ANANDA’S AUMBIENCE AND AUMEGA TRANCE GENRE. FOR DEEP STATES OF MEDITATION AND RELAXATION (NOT FOR DRIVING) All at the coherent cardio rhythm tempo when the heart is in compassionate love in the ECG — 72PM. Its a new Experience. HERE for your Experience ORDER YOURS NOW!!! 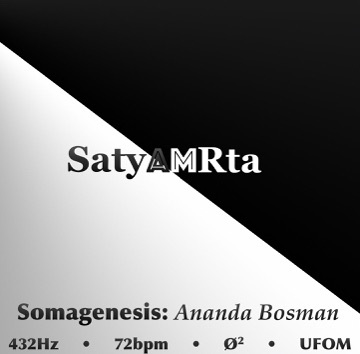 ￼ SatyAMRtA is a new album Ananda Bosman has been creating in 2014, going into a completely new musical adventures... GOING WHERE ANANDA HAS NEVER GONE BEFORE, yet maintaining elegant simplicity, whilst applying even more of the golden harmonics... Complementary to the Deep State style at 72BPM, joining the A=432 Hertz music tuning we expect from Ananda, there are surprises in store here. The packed full larger double CD, has been pre-released for an exclusive fan list (enquire). Final NEW kind of Mastering in 2016/2017 Audio DVD. THIS IS COMPLETELY DIFFERENT MUSIC STYLE TO ANANDA’S AUMBIENCE AND AUMEGA TRANCE GENRE. FOR DEEP STATES OF MEDITATION AND RELAXATION (NOT FOR DRIVING) ENQUIRE HERE ORDER YOURS NOW!!! 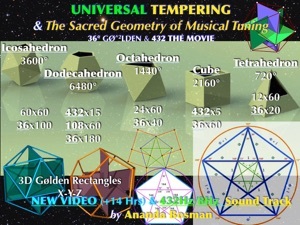 BRAND NEW NOW ￼432 HZ MOVIE: “UNIVERSAL TEMPERING: 8Hz/432 Hz, Discovery Of A New Universal Musical Tuning System. The Sacred Geometry of 432 Hz.” A Film by Ananda Bosman. THIS IS A NEW MUSIC INNOVATION. A NEW DISCOVERY. A NEW, MORE LOGICAL, & UNIVERSAL TUNING OF ALL LIFE & CREATION. Innovations like The 8Hz Cube & The 432 Hz Cube, key to tuning. The movie is packed with revelations, & A New 432 Hz Universal Tempering Music Set holds the background of this 2hours & 48 min documentary. It comes with 14 hours of the 8Hz/432Hz Music Revolution presentation in Berlin (Nov 2015), which also holds brand new material to supplement (or San Marino Sept 2015, for those who want Italian Translation. A combo is available). Order THIS NEW MUSIC INNOVATION HERE. ORDER YOURS NOW!!! WAY BEYOND JUST A 432 HZ CD — INCLUDES 8HZ, CIRCADIAN TEMPOS, & SACRED GEOMETRICAL GOLDEN NUMBER RATIO’S THROUGHOUT THE COMPOSITIONS & MASTERING. A WINNING PIONEERING COMBINATION SCIENTIFICALLY MEASURED TO HAVE ITS EFFECT ON HEALTH, WELLBEING, HEART COHERENCE & INSPIRATIONAL BRAIN STATES WITH HIGHER BIOLOGICAL ENERGY. ONLY ECOLOGICAL QUALITY FORMATS, NOT JUNK MUSIC MP3 COMPRESSION. The LONG AWAITED professional production CD’s of Ananda’s revolutionary A=432 Hz music are NOW available for the world at large. Some of these songs have been measured to have dramatic health & wellbeing effects, scientifically measured. Along with a host of completely new songs, the eagerly awaited new songs since 2008 have received additional enhancement & tuning. Many numerous music styles converge and emerge, which delight & appeal to a variety of musical tastes. With great enthusiasm of this NU birth, here we present Ananda’s very first FULLY professionally produced music CD’s — every level of production, from composing, mastering, equalising, volume db mastering & fades, production, together with the graphic design of the album covers, insert booklets, and CD disk image, are entirely ALL produced by Ananda Bosman and 432hertz.com partner, Simone Waser. AUMbience Of The Heart is our all time most popular CD. The music is used by therapist to increase the coherence of the therapuetic environment, for recreation, to dance to with, as ambient background mus, and even for meditation. This CD charges one in the tasks one is working with. Truly independent music for the first glimmerings of a NU Sovereign World on the looming horizon Attractor Field of NU future history. Limited supplies of this first edition are available NOW. With discounts on bulk orders. Also check for special package offers. This CD combines Melodic Trance and Psytrance styles, all with the harmonic 144BPM, which is 2 times the 72BPM circadian pulse, that tunes all organs. It is great dance music, empowering and giving energy. Great for driving, and recharging when your battery is drained. A wide variety of unique dance styles by Ananda Bosman. Can even be used in meditation, with power breathing, by taking every second heart beat, at 72BPM. Hence, the 144BPM healthy rhythm of the heart when jogging or exercising and dancing, and the coherent heart rhythm when in compassionate love and meditation are co-joined. REMEMBER, ONLY THE CD QUALITY PRODUCES THE STRONG MEASURED HEALTH, WELL-BEING, CIRCADIAN, CARDIO-RHYTHM & CREATIVITY EFFECTS (from the 432Hz, 8Hz, harmonic tempos and UFOM)!!! MEASUREMENTS SHOW THAT COMPRESSION TO MP3 VASTLY DIMINISHES THE EFFECTS. THE COMPRESSION USED IN MP3 & CO WILL NOT RELAY THE EFFECT THAT ONLY CD QUALITY PRODUCES, OVER 90% OF THE INFORMATION IS MISSING WITH MP3. OF COURSE THE SONGS MELODY WILL REMAIN FOR POPULARITY ;-) JUST SO THAT YOU KNOW. IMPORT YOUR SONGS IN AIF OR WAV FORMAT IN iTunes & Other Music Players. 432 HZ MOVIE: “UNIVERSAL TEMPERING: 8Hz/432 Hz, Discovery Of A New Universal Musical Tuning System. The Sacred Geometry of 432 Hz.” A Film by Ananda Bosman. THIS IS A NEW MUSIC INNOVATION. A NEW DISCOVERY. A NEW, MORE LOGICAL, & UNIVERSAL TUNING OF ALL LIFE & CREATION. Innovations like The 8Hz Cube & The 432 Hz Cube, key to tuning. The movie is packed with revelations, & A New 432 Hz Universal Tempering Music Set holds the background of this 2hours & 48 min documentary. It comes with 14 hours of the 8Hz/432Hz Music Revolution presentation in Berlin (Nov 2015), which also holds brand new material to supplement (or San Marino Sept 2015, for those who want Italian Translation. A combo is available). Order THIS NEW MUSIC INNOVATION HERE. The new 432 Hz Standard — CD’s — ARE Here!! !